Did you know that you can ask the deli for only two slices of cheese if that's all that you really need? It's true and because I decided to try this new recipe, my days of ordering from the deli will forever be changed. No more ordering a 1/4 lb. of cheese or lunch meat when I only need a set number of slices! I found this recipe for Cajun Chicken Stuffed with Spinach and Pepperjack Cheese and made a couple slight changes of my own. 1. Sprinkle butterflied chicken breasts inside and out with garlic salt and cajun seasoning. 2. Add wilted spinach, cheese and turkey to center of chicken breasts. Fold chicken breasts and secure with toothpicks. 3. Bake at 350 degrees F for 35 minutes or until chicken is done. My husband and I have really been digging stuffed chicken as of late. We have been making Chicken Cordon Bleu and this recipe quite a bit! Stuffing chicken is a simple way to switch things up when you need a change to your same old chicken plate. Readers, please tell me that I'm not the only one who thought you had to order lunch meat and cheese from the deli in pound or a fraction of a pound form? This looks amazing!! Thanks for sharing!! I never knew you could buy just a couple slices of cheese at the deli either! What a great idea for cheese types that I want to just use for one certain recipe! 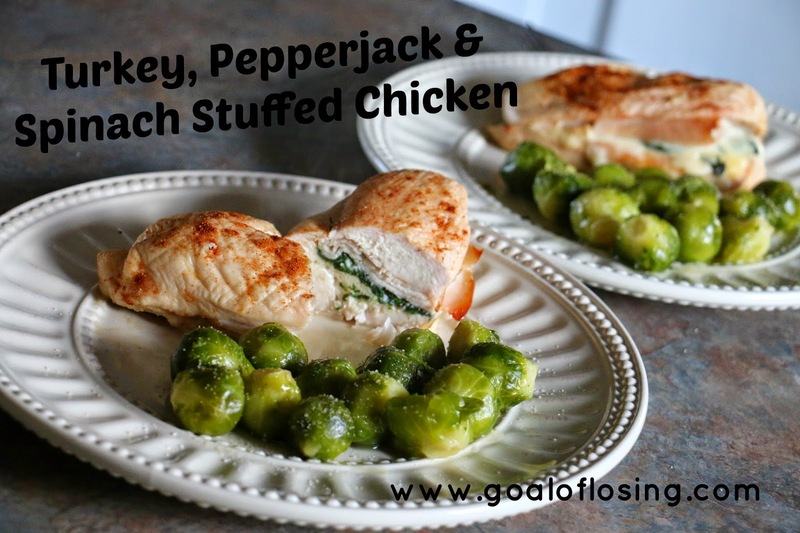 I LOVE this stuffed chicken!! :) Looks delish!